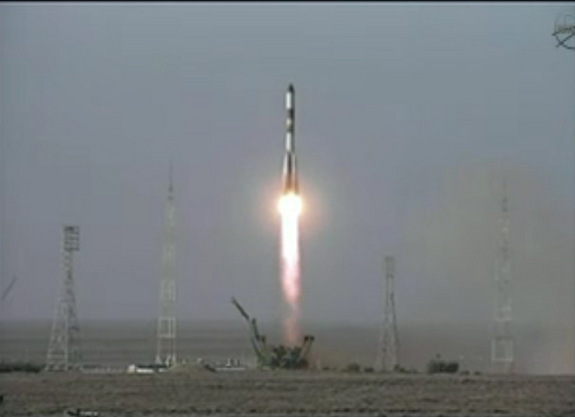 A Progress M-13M cargo resupply capsule was successfully launched today, October 30, 2011, from the Baikonur cosmodrome. Along with the Progress, the rocket carried the 40 kg small satellite Chibis-M, designed to study gamma radiation in atmospheric lightning. The Progress capsule is slated to dock with ISS on Wednesday, averting the first unmanned operation of the International Space Station (ISS) since 2000. Today’s launch follows the August 24 catastrophic failure of Progress M-12M, which crashed in Siberia after separation failure of the third stage. The incident, caused by a faulty gas generator, triggered a period of reviews of quality control procedures, with tighter quality controls for this latest launch. All the Soyuz third stages produced so far have been reexamined to confirm absence of similar defects. New safety measures have also been instituted, including installation of video monitoring of Soyuz booster assembly. 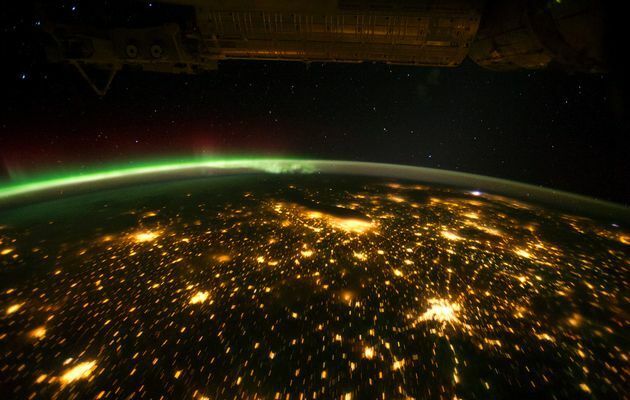 A photograph of North America taken from the International Space Station on October 29. Failure of the October 30 launch could have resulted in unmanned operation of ISS (Credits: HO/Reuters and Times Live). Failure of today’s launch would have resulted in delays to the November 13 launch, which will carry NASA astronaut Dan Burbank and Russian cosmonauts Anatoly Ivanishin and Anton Shkaplerov to replace the current ISS crew, whose return to Earth is scheduled for November 21. The Progress cargo ship utilizes a Soyuz-U third stage similar to the Soyuz-FG used for manned launches. The August 24 failure caused considerable concerns across international space agencies about the safety of the Soyuz rocket. The Soyuz is currently the only active manned transport vehicle since the retirement of NASA’s Space Shuttle earlier this year. The successful launch of Progress M13-M paves the way for resumption of normal ISS transportation operation. “Pending the outcome of a series of flight readiness meetings in the coming weeks, this successful flight sets the stage for the next Soyuz launch, planned for mid-November,” said Bill Gerstenmaier, associate administrator for Human Exploration and Operations at NASA headquarters in response to today’s launch. “The December Soyuz mission will restore the space station crew size to six and continue normal crew rotations,” he said. The fault in the August launch was determined to be due to human error, a one time event that resulted in a blocked fuel line. Despite this finding, all Soyuz third stages were reexamined to confirm absence of similar defects. New safety measures were also instituted, including installation of video monitoring of Soyuz booster assembly.